Poptopia: The Pop Secret game with a dongle that makes your phone smell like popcorn. There’s no one on Earth who likes popcorn or video games more than I do, so it would seem that Poptopia, a new smartphone game from Pop Secret, would be the ultimate combination of the things that give me pleasure. Instead, it’s the sum of all fears, thanks to a disquieting little device called the Pop Dongle. The Pop Dongle plugs into your headphone jack, transforming Poptopia into the world’s first scented smartphone game. And what’s the object of Poptopia? 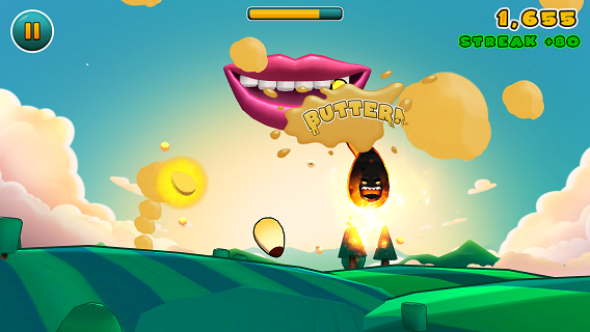 A press release lays it out: “Players try to perfectly pop as many popcorn kernels as they can to please ‘The Almighty Mouth.’ Every time you successfully swipe the butter in the game, the Pop Dongle sends out a popcorn scented spritz.” To recap: Trigger a dongle spritz to please the mouth. Poptopia, which is free, is a variation of the balloon-popping games that glutted the smartphone and Nintendo DS libraries shortly after these systems first hit the market. (If you have an Android device, you may have played the similar game Ninja Popcorn.) Smiling little popcorn kernels fly across the screen; when a kernel glows, it means it’s ready to be tapped, “popping” it and sending it flying into the disembodied Almighty Mouth, which responds with decadent groans like Audrey II in Little Shop of Horrors. Poptopia probably isn’t the worst game in the App Store, but it’s one of the worst I’ve played. Then again, I wasn’t afforded the pleasure of playing with the Pop Dongle. Turns out that for all this hoopla, only three Pop Dongles, which for the record look more like tumorous little suns than buttered popcorn flakes, are being made available to the public. Why is Pop Secret dooming so many noses to game-related ennui? To drive up the price of the three being auctioned off on eBay. The first Pop Dongle auction ends today (and stands at $315 as of this writing). All proceeds go to the American Red Cross, and all publicity goes to Pop Secret, so it’s a good cause either way. And if you don’t have $315 sitting around to spend on a dongle, you can always hold out for the Mega Man cologne.